Yes, yes, yes we all want to be successful and have tried multiple ways and means to get there, but in actuality, success comes from three things: a goal, a commitment to action, and service to others. In 1908, Napoleon Hill, (the famous motivational author whose book “Think and Grow Rich” became all-time best-seller in the field) conducted a series of interviews with 500 successful men and women and discovered and publish the formula for success. The book “Think and Grow Rich” was the result of 25 years of study by Napoleon Hill, under the guidance of Andrew Carnegie. Later in 1956, Earl Nightingale, the Dean of Personal Development, recorded a concise version of the book “Think and Grow Rich” into a record known as “The Strangest Secret”. This record sold over million copies and continues to motivate thousands of people to move towards success. 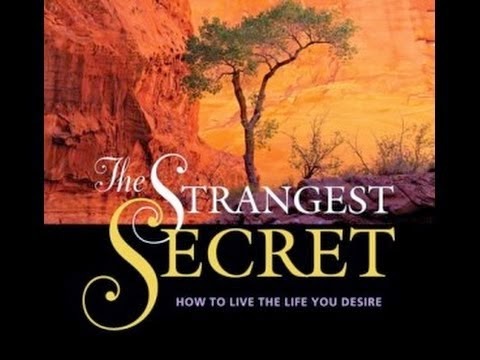 The Strangest Secret is a ‘secret’, because there are only few who understand it and use it to become successful. And it is ‘strange’ because, the secret is actually known to everyone. It is written in all the religious books, told by the great leaders and even proven scientifically. The Secret is within the six words – “We Become What We Think About.” Translate this to – “As you sow, so shall you reap,” “You are the sculpture of your own life,” “Your future is in your hands” and many other quotes and phrases. Listen to this Audio and let Earl Nightingale, with his extremely deep voice, unwrap the secret to you. If you follow each and every word in this recording, you cannot help but become successful. It’s about this that I want to talk with you. We live today in a golden age. This is an era that humanity has looked forward to, dreamed of, and worked toward for thousands of years. We live in the richest era that ever existed on the face of the earth … a land of abundant opportunity for everyone. That’s why it’s so easy to make a living today. It takes no particular brains or talent to make a living and support a family today. We have a plateau of so-called “security.” So, to succeed, all we must do is decide how high above this plateau we want to aim. The human mind is much like a farmer’s land. The land gives the farmer a choice. He may plant in that land whatever he chooses. The land doesn’t care what is planted. It’s up to the farmer to make the decision. The mind, like the land, will return what you plant, but it doesn’t care what you plant. If the farmer plants too seeds — one a seed of corn, the other nightshade, a deadly poison, waters and takes care of the land, what will happen? The human mind is far more fertile, far more incredible and mysterious than the land, but it works the same way. It doesn’t care what we plant … success … or failure. A concrete, worthwhile goal … or confusion, misunderstanding, fear, anxiety, and so on. But what we plant it must return to us. The paradox is that exactly the reverse is true. Everything that’s really worthwhile in life came to us free — our minds, our souls, our bodies, our hopes, our dreams, our ambitions, our intelligence, our love of family and children and friends and country. All these priceless possessions are free. I remember one time I was driving through eastern Arizona and I saw one of those giant earthmoving machines roaring along the road with what looked like 30 tons of dirt in it — a tremendous, incredible machine — and there was a little man perched way up on top with the wheel in his hands, guiding it. As I drove along I was struck by the similarity of that machine to the human mind. Just suppose you’re sitting at the controls of such a vast source of energy. Are you going to sit back and fold your arms and let it run itself into a ditch? Or are you going to keep both hands firmly on the wheel and control and direct this power to a specific, worthwhile purpose? It’s up to you. You’re in the driver’s seat. You see, the very law that gives us success is a doubleedged sword. We must control our thinking. The same rule that can lead people to lives of success, wealth, happiness, and all the things they ever dreamed of — that very same law can lead them into the gutter. It’s all in how they use it … for good or for bad. That is The Strangest Secret! The moment you decide on a goal to work toward, you’re immediately a successful person — you are then in that rare group of people who know where they’re going. Out of every hundred people, you belong to the top five. Don’t concern yourself too much with how you are going to achieve your goal — leave that completely to a power greater than yourself. All you have to do is know where you’re going. The answers will come to you of their own accord, and at the right time. Look at it every chance you get during the day and just before going to bed at night. As you look at it, remember that you must become what you think about, and since you’re thinking about your goal, you realize that soon it will be yours. In fact, it’s really yours the moment you write it down and begin to think about it. 2. Stop thinking about what it is you fear. Each time a fearful or negative thought comes into your mind, replace it with a mental picture of your positive and worthwhile goal. And there will come a time when you’ll feel like giving up. It’s easier for a human being to think negatively than positively. That’s why only five percent are successful! You must begin now to place yourself in that group. Don’t start your test until you’ve made up your mind to stick with it. If you should fail during your first 30 days — by that I mean suddenly find yourself overwhelmed by negative thoughts — simply start over again from that point and go 30 more days. Gradually, your new habit will form, until you find yourself one of that wonderful minority to whom virtually nothing is impossible. Above all … don’t worry! Worry brings fear, and fear is crippling. The only thing that can cause you to worry during your test is trying to do it all yourself. Know that all you have to do is hold your goal before you; everything else will take care of itself.